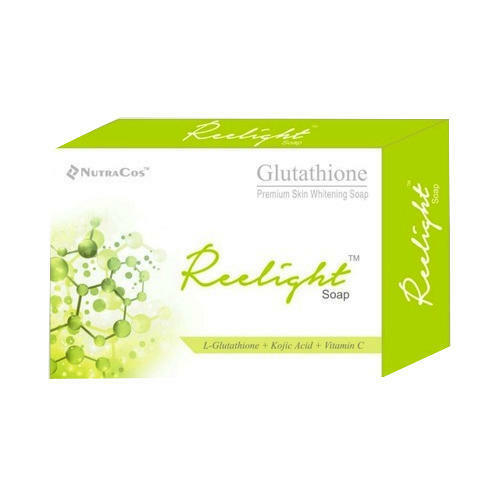 Relight soap (Kojic Acid & Glutathione & vitamin c) Skin Whitening Soap 75g Triple Strength Lightening with Glutathione, Kojic Acid and known to help even out blemishes, remove impurities such as dark spots, pimple marks and help lighten and refine skin complexion. Effective and safe method to lighten the skin gradually. It keeps your skin glowing, fair, even, radiant and blemish free Features & details Most Advanced Formula for Skin Whitening Triple Strength Lightening with Glutathione, Kojic Acid and Vitamin C known to help even out blemishes, remove impurities such as dark spots, pimple marks and help lighten and refine skin complexion. Effective and safe method to lighten the skin gradually. Indications Most Advanced Formula for Skin Whitening & Skin Lightening Ingredients Kojic Acid, Glutathione,Vitamin C,Milk honey extract,Vit E Directions Use this soap daily on face and other parts of body as required during bath.